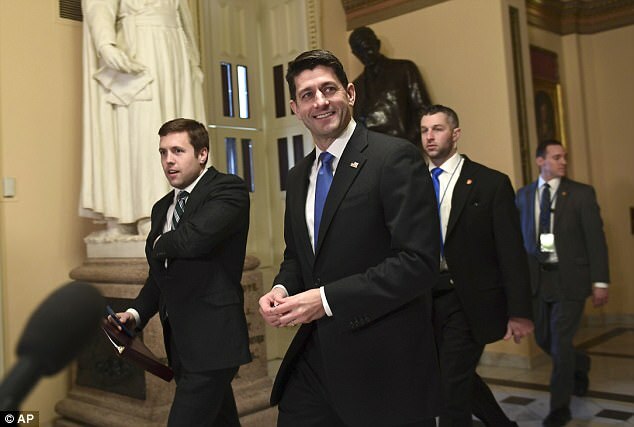 The Senate passed the GOP’s $1.5 trillion tax cut early Wednesday morning, leaving just one technical hurdle and President Trump’s signature as the final steps before the president’s top legislative priority becomes reality. 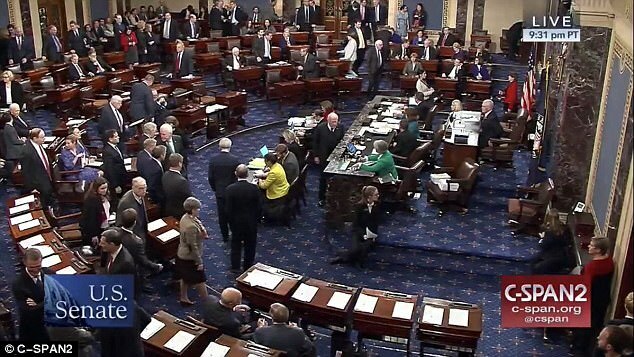 There was little last-minute drama in the Senate, where the final tally was 51-48, hardly different from the original version that cleared the Senate earlier this month. Not a single Democrat voted for it, just as no House Democrat voted for a version Tuesday. 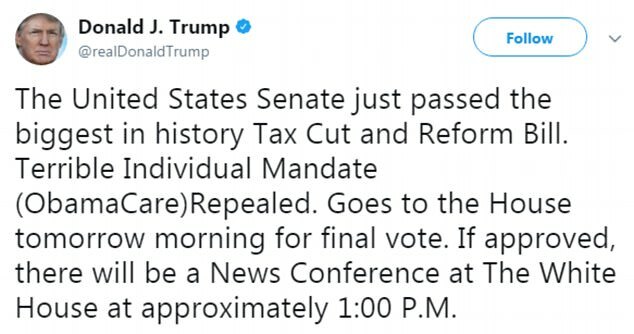 Moments after the bill was passed, Trump was quick to hail its passing and said if approved by the House Wednesday morning, there will be a news conference at 1pm. 'The United States Senate just passed the biggest in history Tax Cut and Reform Bill,' he tweeted just after 1am. A wave of protesters provided one of the biggest bursts of emotion. A group of people yelled out ‘Kill the bill, don't kill us!’ as the final vote was being taken. 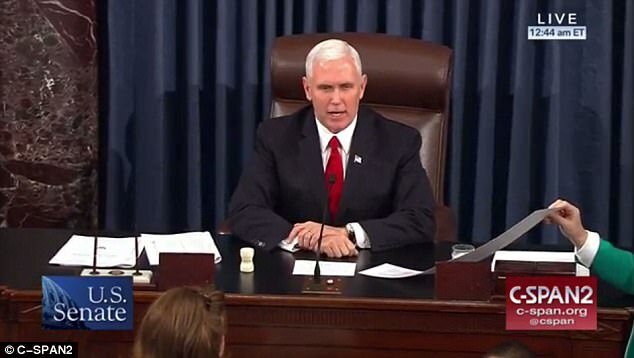 ‘The Sergeant at Arms will restore order in the gallery,’ said Vice President Mike Pence, who was presiding over the chamber. Pence’s appearance was a flourish that put him in the spotlight – though party leaders knew in advance his potential tie-breaking vote was not needed. Flake voted for the bill, weeks after warning colleagues against complicity with Trump. Before the vote, as the debate stretched toward midnight, Pence tweeted out a photo of himself huddling with Treasury Secretary Steve Mnuchin and economic advisor Gary Cohn. The House still had to sort through one legislative hiccup – after Democrats raised a procedural objection to minor provisions in the bill that the Senate parliamentarian ruled were not allowable. 'After eight straight years of slow growth and under-performance, America is ready to take off,' said Senate Majority Leader Mitch McConnell of Kentucky at a press conference after passage. 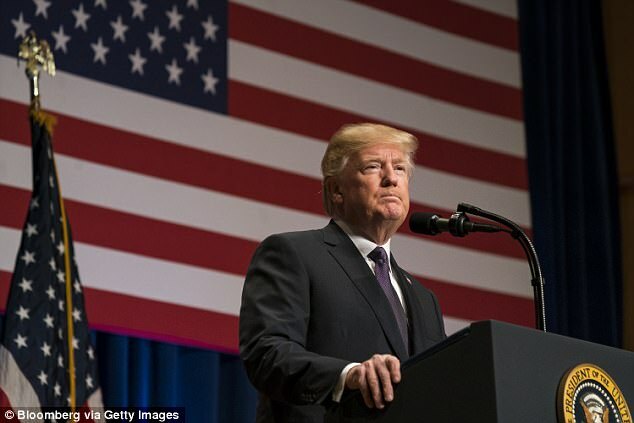 The parliamentary ruling, which got sustained after Republicans failed to strike it down, requires the House to revote on a new version bill Wednesday morning so that each bill is identical and President Trump can sign it. He called for order during his floor speech and barked at colleagues who were talking rather than listening. ‘This is serious stuff. We believe you’re messing up America. You could pay attention for a couple of minutes,’ he grumbled. Wavering senators removed most of the drama by announcing their support in advance. Tennessee Sen. Bob Corker, who Trump mocked as ‘liddle’ during an earlier feud, flipped from opposing the earlier version to supporting the final conference report that cleared the Senate Tuesday night. Sen. Susan Collins of Maine announced her support in advance. Sen. John McCain, who provided a dramatic thumbs-down to the GOP’s ‘skinny’ Obamacare repeal bill, is recovering at home from his treatment for brain cancer. He announced his backing for an earlier version of the tax cut. The hours-long debate Tuesday was mostly pro forma. 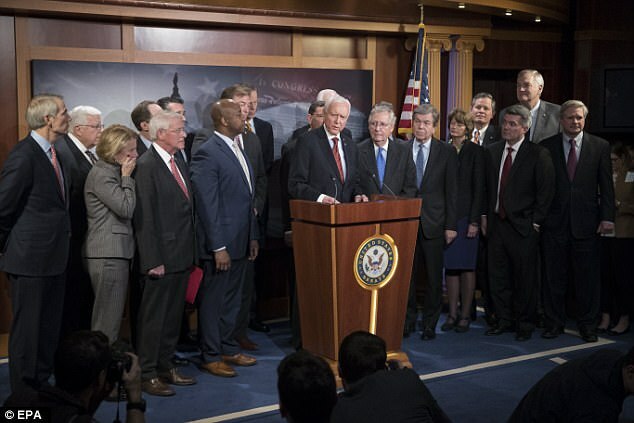 Senate Finance Committee Chairman Orrin Hatch bemoaned the lack of Democratic support – although leaders decided to move the bill through ‘reconciliation’ procedures that allowed them to circumvent the minority and pass it on a simple majority. ‘Where is this bipartisanship that this country desperately needs?’ asked Hatch. ‘Our tax policy is for the birds,’ he added. As the hours drew on, senators continued to inveigh one way or the other to a mostly empty chamber but with an eye toward C-Span and cable audiences. ‘Not a single Democrat would break from party discipline,’ complained Texas Republican Sen. Ted Cruz. ‘Why? Because they are so united in their rage at President Trump,’ the president’s former primary rival said. He said families would see benefits in their pay stubs within weeks. Democrats saw their hopes dashed of scoring another dramatic defeat of a GOP initiative, after seeing the Obamacare repeal tank earlier this year. Now, all that is left for the House to do is vote again following an earlier technical parliamentary error. 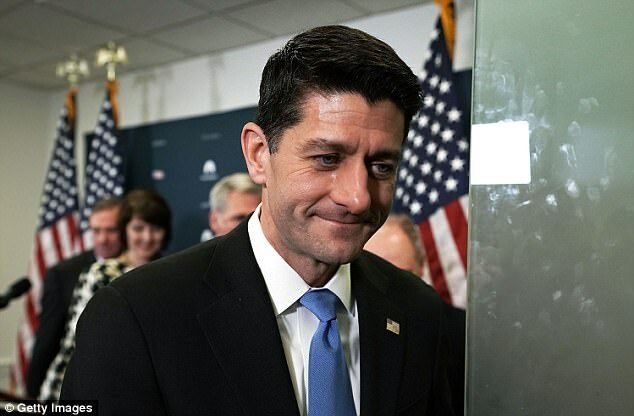 Speaker Ryan, who earlier said 'this is a day I've been looking forward to for a long time', will get to relive his dream Wednesday, because a few minor provisions in the House bill were out of order. That would require another procedural motion to ensure both chambers are passing identical measures. In that case, the House would meet at 9am Wednesday and then vote. The rule prevents certain types of legislating in what is nominally a revenue bill – crammed into a special procedure that only requires a simple majority to pass to avoid having to negotiate with Democrats. One of the out-of-order provisions lets people save in tax-deferred 529 plans to home school their kids, Politico reported. Another may deal with a college's exemption from an endowment tax. It is up to Democrats or any senator to raise an objection to force a ruling. 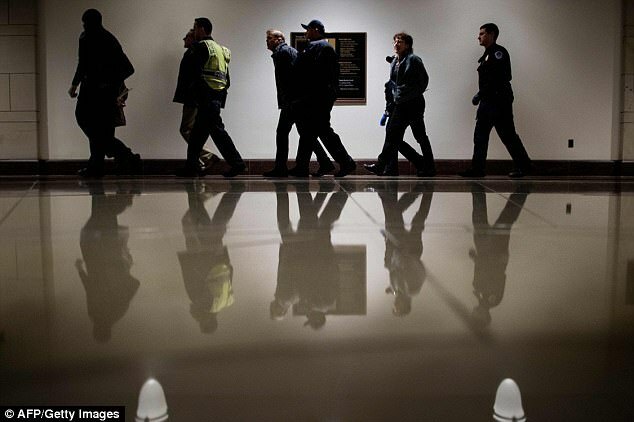 A Senate leadership aide downplayed the hiccup in the final stretch. 'No one’s fault. They’re tiny provisions that don’t affect the overall bill. These small provisions were all that Dems could find. The House will pass again,' the aide said. An amendment by Texas Sen. Ted Cruz made it into the final conference report, allowing parents to withdraw up to $10,000 from tax-deferred 529 college savings plans for home schooling their kids at a younger age. The plans could now be used for K-12 elementary and secondary tuition, including for home-schooling. Aides were still scrambling to figure out how the technical ruling would affect the legislation. Cruz touted the amendment on his Senate and campaign web site. 'By expanding choice for parents and opportunities for children, we have prioritized the education of the next generation of Americans,' Cruz said on the Senate floor when the amendment passed on a tie vote with an assist from Vice President Mike Pence. A Senate GOP aide told DailyMail.com the only portion likely to be knocked out involved home schooling – not the bulk of the amendment for the first time making 529s eligible for K-12 schools including private or parochial schools. In states that define home-schooling as a type of private school, it is possible that funding could still be eligible. WHAT'S IN THE FINAL TAX BILL? Just 12 Republicans voted against the final conference report in the House. Among them were Reps. Rodney Frelinghuysen of New Jersey, the House Appropriations Committee chairman, Rep. Darrel Issa of California, and Rep. Dana Rohrabacher of California. All three of them represent high-tax states where some constituents could get slammed by a provision that caps the deduction for state and local taxes. There was just one GOP opponent outside of the Democratic-leaning states of New Jersey, New York, and California – Rep. Walter Jones of North Carolina. President Trump lauded House Republican supporters on Twitter. 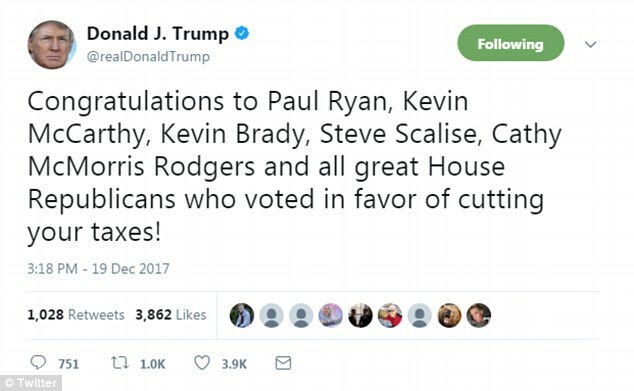 'Congratulations to Paul Ryan, Kevin McCarthy, Kevin Brady, Steve Scalise, Cathy McMorris Rodgers and all great House Republicans who voted in favor of cutting your taxes!' he wrote. Not a single Democrat voted for the GOP-crafted conference report – a steep partisan split that is already leading to questions about whether the cuts will be able to endure for the long term. The White House maintained that the president could be facing a tax increase, even as it said his business would fare well. 'We expect that it likely will, certainly on the personal side, could cost the president a lot of money. Again, the president's focus hasn't necessarily been at all on himself,' said White House press secretary Sarah Huckabee Sanders. Treasury Secretary Steven Mnuchin sat in the House chamber for a portion of the final debate. In another signal of the low-drama move to final passage, Sens. Mike Lee of Utah and Susan Collins of Maine each announced their support for the final bill Monday. That left the GOP within sight of victory even as Sen. John McCain of Arizona recuperated at home from complications of his brain cancer. 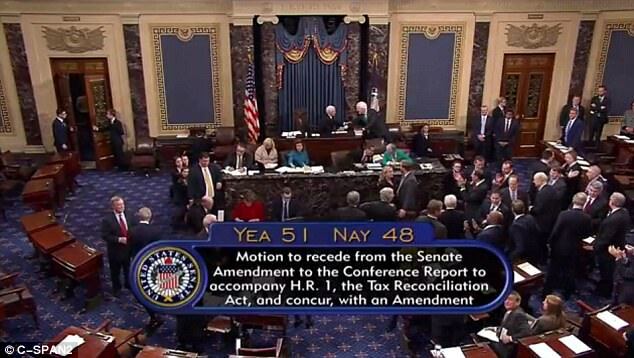 The Senate passed its first version of the tax cut by a vote of just 51-49. 'This is profound change, and this is change that's going to put our country on the right path,' Ryan said immediately after the vote. 'We said in 2016 that it would take real tax reform for families and businesses to get the American economy going. And we were serious,' he said. And he indicated that more tax cuts were on the way in the future. Individual rate cuts are set to expire in a decade under required procedural rules. The initial tax legislation was introduced barely six weeks ago on November 2, and the final House-Senate compromise text wasn't released until Friday evening. The race for immediate passage was driven by several factors. Republican leaders were determined not to let the 1,100 page final bill linger so it might get picked apart by critics. On Saturday, just in the initial hours after it was announced, it was revealed that a change to the language for 'pass-through' corporations would benefit income-earning real estate holders like President Donald Trump and opponent-turned-supported Sen. Bob Corker of Tennessee. In a show of Republican unity despite polls showing public opposition to the plan, the House GOP easily turned back a Democratic motion to recommit the bill to committee with instructions to change it. Protesters in the House visitors' gallery shouted 'Shame! Shame!' as the final tally was taken. 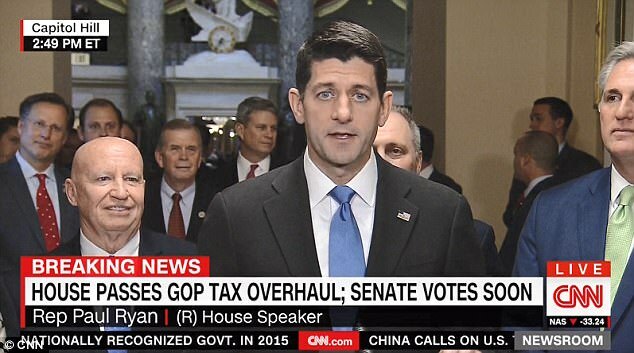 Ryan cast the bill in kitchen table terms, saying it would benefit families 'living paycheck to paycheck' – even as Democrats pointed out the bill crafted by Republican negotiators slashed the top income tax rate, lowered corporate taxes, and doubled the size of the exemption for estates that come under the federal estate tax. Under the bill, estates worth $11.2 million would be subject to the estate tax, up from $5.6 million. The bill slashes income tax rates, including lowering the top bracket of 39.6 per cent down to 37 per cent. Corporate tax rates would plummet from 35 per cent to a new 21 per cent bracket. The outcome of the House vote wasn't in doubt Tuesday, as Democrats took their last opportunity to bash the proposal as it moved forward. 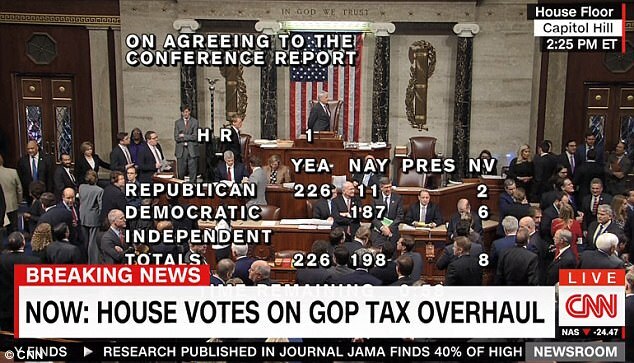 'Today we choose what kind of country America will be: one that champions the ladders of opportunity for all, or one that reinforces the power of the wealthiest and well-connected,' said House minority leader Nancy Pelosi of California. 'Why aren't they joining us on insisting for a better deal for American families?' 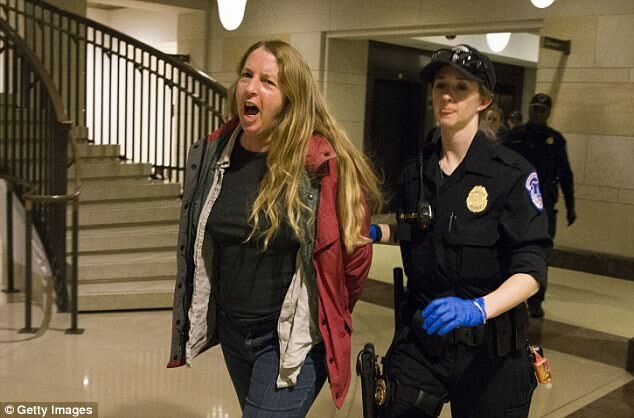 she said of Republicans. 'Why aren't they joining us in demanding that we write real bipartisan tax reform that puts the middle class first? Because helping the middle class has never been their goal,' she said. 'Republicans will vote to catastrophically explode our national debt ... where are the vaunted Republican deficit hawks? Are they endangered? Are they extinct?' she said. Republicans pushed back against Democratic claims that the bill was structured to reward the donor class. 'Opponents to this tax bill, they don't really worry about tax cuts for the rich. They worry about tax cuts for you,' said Ways and Means Chairman Rep. Kevin Brady. 'Given the choice between the federal government and you, we choose you, hard-working American taxpayers. We choose you, the only special interest that truly matters,' he said. Republicans insist that the sweeping package of tax cuts for corporations, small businesses and individuals will boost economic and job growth. They also see the measure as key to having any hope of retaining their majorities in the House and Senate when voters go to the polls next November. The end-of-year sprint toward passage represents a remarkable recovery of Republican fortunes since the middle of this year, when the party's drive to dismantle former Democratic President Barack Obama's Obamacare healthcare law crumbled in the Senate and prospects for a tax overhaul seemed doomed by party infighting. This year the BANKSTERS take $276.2 billion from you as "interest" on the National Debt. Here is the Debt Clock - http://www.usdebtclock.org/ --- you can watch it real time. This is at a time of historically low rates ..... what happens when rates go up? Trump is INCREASING the debt, and thus the interest payments ..... NOT paying off the debt. Trump is a MORON. Get some FACTS straight .... the DOW, NASDAQ, & S&P are hitting all time highs. Unemployment is supposed to be at all time LOWS. We are supposedly having a glorious upsurge in the economy, If we do not pay off the debt NOW when will we? All this glorious economic news and we still have DEFICITS?! 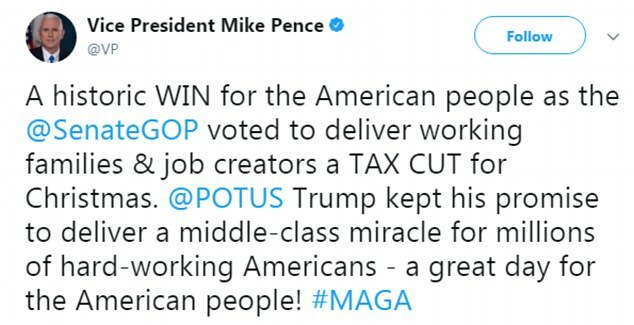 Why do you have to "cut taxes for the already rich" so they will supposedly be inspired to create more jobs ...... when everybody is supposedly employed???!! And the true job creation is proven to be by Small Business and financed by Middle Class spending, NOT by millionaires. We should be raising taxes. If these Billionaires had to pay a proportionate amount equal to the benefit they derive from Us protecting Their money, property, LIVES ........ they would take an interest in getting a GOOD government not just one that serves their immediate interests .... They would insist on ending corruption and waste and balancing the books. People whine there is no such thing as "fair" taxes ,,,,, but there is . The Workers pay with blood & money for ONE house with a mortgage to the BANKSTERS ..... counting all they pay for state, local, sales, federal taxes 1/3 of their gross. The Billionaires whine they need tax cuts "to create jobs" and NEVER SERVE in uniform so they never get PTSD, amputations, maimed or die. TAKE 60% of their gross because they own multiple homes with NO mortgages.